The victory of the Parliamentarian New Model Army, under Sir Thomas Fairfax and Oliver Cromwell, over the Royalist army, commanded by Prince Rupert, at the Battle of Naseby (14 June 1645) marked the decisive turning point in the English Civil War. Establishment of the Republican Commonwealth under the leadership of Oliver Cromwell. The English Civil War (1642–1651) was a series of armed conflicts and political problems between Parliamentarians (Roundheads) and Royalists (Cavaliers). The first (1642–46) and second (1648–49) civil wars pitted the supporters of King Charles I against the supporters of the Long Parliament, while the third war (1649–51) saw fighting between supporters of King Charles II and supporters of the Rump Parliament. The Civil War ended with the Parliamentary victory at the Battle of Worcester on 3 September 1651. The English Civil War led to the trial and execution of Charles I, the exile of his son, Charles II, and replacement of English monarchy with, first, the Commonwealth of England (1649–53), and then with a Protectorate (1653–59), under Oliver Cromwell's personal rule. The monopoly of the Church of England on Christian worship in England ended with the victors consolidating the established Protestant Ascendancy in Ireland. Constitutionally, the wars established the precedent that an English monarch cannot govern without Parliament's consent, although this concept was legally established only with the Glorious Revolution later in the century. 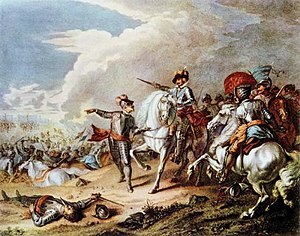 The term English Civil War appears commonly in the singular form, although historians often divide the conflict into two or three separate wars. Although the term describes events as impinging on England, from the outset the conflicts involved wars with and civil wars within both Scotland and Ireland; see Wars of the Three Kingdoms for an overview. Unlike other civil wars in England, which focused on who ruled, this war also concerned itself with the manner of governing the three kingdoms of England, Scotland, and Ireland. The 1911 Encyclopædia Britannica called the series of wars the Great Rebellion, while some historians, especially Marxists such as Christopher Hill (1912–2003), have long favoured the term English Revolution. War broke out less than fifty years after the death of Elizabeth I of England in 1603. Elizabeth's death had resulted in the accession of her first cousin twice removed King James VI of Scotland to the English throne as James I of England, resulting in the then-unprecedented personal union of the Scottish and English kingdoms. As King of Scots, James had become accustomed to Scotland's weak parliamentary tradition since assuming control of the Scottish government in 1583, so that upon assuming power south of the border, the new King of England was genuinely affronted by the constraints the English Parliament attempted to place on him in exchange for money. In spite of this, James' personal extravagance meant he was perennially short of money and had to summon Parliaments often. James' personal extravagance was tempered by his peaceful disposition, so that by the succession of his son Charles I to the English and Scottish thrones in 1625 the two kingdoms had both experienced relative peace, both internally and in their relations with each other, for as long as anyone could remember. [Clarification needed] Charles hoped to unite the kingdoms of England, Scotland and Ireland into a new single kingdom, fulfilling the dream of his father. Many English Parliamentarians had suspicions regarding such a move, because they feared that setting up a new kingdom might destroy the old English traditions which had bound the English monarchy. As Charles shared his father's position on the power of the crown (James had described kings as "little Gods on Earth", chosen by God to rule in accordance with the doctrine of the "Divine Right of Kings"), the suspicions of the Parliamentarians had some justification. Before the fighting, the Parliament of England did not have a large permanent role in the English system of government - instead, Parliament functioned as a temporary advisory committee. Parliament was only summoned if and when the monarch saw fit to summon it. Once summoned a parliament's continued existence was the King's pleasure, since it was subject to dissolution by him at any time. Yet in spite of this limited role Parliament had, over the preceding centuries, acquired de facto powers of enough significance that monarchs could not simply ignore them indefinitely. Without question, for a monarch Parliament's most indispensable power was its ability to raise tax revenues far in excess of all other sources of revenue at the Crown's disposal. By the seventeenth century, Parliament's tax-raising powers had come to be derived from the fact that the gentry was the only stratum of society with the ability and authority to actually collect and remit the most meaningful forms of taxation then available at the local level. This meant that if the King wanted to ensure a smooth collection of revenue, he needed the co-operation of the gentry - for all of the Crown's legal authority, by any modern standard its resources were limited to the extent that if and when the gentry refused to collect the King's taxes on a national scale, the Crown lacked any practical means with which to compel them. Therefore, in order to secure their co-operation, monarchs permitted the gentry (and only the gentry) to elect representatives to sit in the House of Commons. When assembled along with the House of Lords, these elected representatives formed a Parliament. Parliaments therefore allowed representatives of the gentry to meet, primarily (at least in the opinion of the monarch) so that they could give their sanction to whatever taxes the monarch expected their electorate to collect. In the process, the representatives could also confer and send policy-proposals to the King in the form of Bills. However, Parliament lacked any legal means of forcing its will upon the monarch — its only leverage with the King was the threat of its withholding of the financial means required to execute his plans. Many concerns were raised over Charles's marriage to a Roman Catholic, French princess Henrietta Maria, in 1625. They were married immediately after Charles ascended the throne. Charles's marriage raised the possibility that his children, including an heir to the throne, might grow up as Catholics. This was quite an alarming prospect for officially Protestant England, where the Church of England is led by the Supreme Governor, investing the Head of Church in the same person as the Head of State, in this instance the King. Charles was also keen to intervene on the Protestant side of the Thirty Years' War that was currently engulfing Europe., a popular position to take in England. This, however, led to contretemps with Parliament as foreign wars necessitated heavy expenditures, and the Crown could raise taxes only through Parliamentary consent. Charles experienced further financial difficulty when his first Parliament refused to assign him the traditional right to collect customs duties for his entire reign, deciding instead to grant it only on a provisional basis and negotiate with him. Charles I avoided calling a Parliament for the next decade, a period known as the "personal rule of Charles I", or the "Eleven Years' Tyranny". During this period, Charles's lack of money determined policies. First and foremost, to avoid Parliament the King needed to avoid war. Charles made peace with France and Spain, effectively ending England's involvement in the Thirty Years' War; however, that in itself was far from enough to balance the Crown's finances. Unable to raise revenue through Parliament – and unwilling to convene it – Charles resorted to other means. One method was reviving certain conventions, often long-outdated. For example, a failure to attend and to receive knighthood at Charles's coronation was a finable offence with the fine paid to the Crown. The King also tried to raise revenue through the ship money tax, by exploiting a naval war-scare in 1635, demanding that the inland English counties pay the tax for the Royal Navy. Established law supported this policy, but authorities had ignored it for centuries, and many regarded it as yet another extra-Parliamentary (and therefore illegal) tax. Some prominent men refused to pay ship money, arguing that the tax was illegal, but they lost in court, and the fines imposed on them for refusing to pay ship money (and for standing against the tax's legality) aroused widespread indignation. The end of Charles's independent governance came when he attempted to apply the same religious policies in Scotland. The Church of Scotland, reluctantly episcopal in structure, had independent traditions. Charles, however, wanted one uniform Church throughout Britain and introduced a new, High Anglican version of the English Book of Common Prayer to Scotland in summer of 1637. This was violently resisted; a riot broke out in Edinburgh, which may have been started in a church by Jenny Geddes. In February 1638, the Scots formulated their objections to royal policy in the National Covenant. This document took the form of a "loyal protest," rejecting all innovations not first having been tested by free parliaments and General Assemblies of the Church. In the spring of 1639, King Charles I accompanied his forces to the Scottish border to end the rebellion known as the Bishops' War. But, after an inconclusive military campaign, he accepted the offered Scottish truce – the Pacification of Berwick. The truce proved temporary, and a second war followed in summer of 1640. This time, a Scots army defeated Charles's forces in the north, then captured Newcastle. Charles eventually agreed not to interfere with Scotland's religion and paid the Scots' war-expenses. The Long Parliament then passed the Triennial Act, also known as the Dissolution Act in May 1641, to which the Royal Assent was readily granted. The Triennial Act required that Parliament was to be summoned at least once every three years, and that when the King failed to issue proper summons, the members could assemble on their own. This act also forbade ship money without Parliament's consent, fines in destraint of knighthood and forced loans. Monopolies were cut back severely, and the Courts of Star Chamber and High Commission were abolished by the Habeas Corpus Act 1640 and the Triennial Act respectively. All remaining forms of taxation were legalised and regulated by the Tonnage and Poundage Act. On 3 May, Parliament decreed The Protestation, attacking the 'wicked counsels' of Charles's government, whereby those who signed the petition undertook to defend 'the true reformed religion,' parliament, and the king's person, honour and estate. Throughout May, the House of Commons launched several bills attacking bishops and episcopalianism in general, each time defeated in the Lords. In the summer of 1642 these national troubles helped to polarise opinion, ending indecision about which side to support or what action to take. Opposition to Charles also arose owing to many local grievances. For example, the imposition of drainage-schemes in The Fens negatively affected the livelihood of thousands of people after the King awarded a number of drainage-contracts. Many regarded the King as worse than insensitive, and this played a role in bringing a large part of eastern England into Parliament’s camp. This sentiment brought with it people such as the Earl of Manchester and Oliver Cromwell, each a notable wartime adversary of the King. Conversely, one of the leading drainage contractors, the Earl of Lindsey, was to die fighting for the King at the Battle of Edgehill. In early January 1642, a few days after his failure to capture five members of the House of Commons, fearing for the safety of his family and retinue, Charles left the London area for the north of the country. Further negotiations by frequent correspondence between the King and the Long Parliament through to early summer proved fruitless. As the summer progressed, cities and towns declared their sympathies for one faction or the other: for example, the garrison of Portsmouth under the command of Sir George Goring declared for the King, but when Charles tried to acquire arms for his cause from Kingston upon Hull, the depository for the weapons used in the previous Scottish campaigns, Sir John Hotham, the military governor appointed by Parliament in January, initially refused to let Charles enter Hull, and when Charles returned with more men, drove them off. Charles issued a warrant for Hotham to be arrested as a traitor but was powerless to enforce it. Throughout the summer months, tensions rose and there was brawling in a number of places, with the first death from the conflict taking place in Manchester. Charles' secret pacts and encouragement of his supporters to break their parole caused Parliament to debate whether to return the King to power at all. Those who still supported Charles' place on the throne tried once more to negotiate with him. Furious that Parliament continued to countenance Charles as a ruler, the Army marched on Parliament and conducted "Pride's Purge" (named after the commanding officer of the operation, Thomas Pride) in December 1648. Troops arrested 45 Members of Parliament and kept 146 out of the chamber. They allowed only 75 Members in, and then only at the Army's bidding. 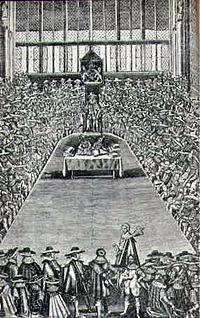 This Rump Parliament received orders to set up, in the name of the people of England, a High Court of Justice for the trial of Charles I for treason. At the end of the trial the 59 Commissioners (judges) found Charles I guilty of high treason, as a "tyrant, traitor, murderer and public enemy". 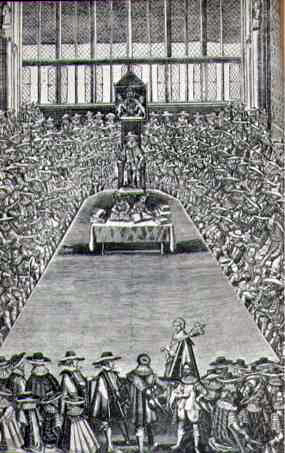 His beheading took place on a scaffold in front of the Banqueting House of the Palace of Whitehall on 30 January 1649. After the Restoration in 1660, of the surviving regicides not living in exile nine were executed and most of the rest sentenced to life imprisonment. The execution of Charles I altered the dynamics of the Civil War in Scotland, which had raged between Royalists and Covenanters since 1644. By 1649, the struggle had left the Royalists there in disarray and their erstwhile leader, the Marquess of Montrose, had gone into exile. 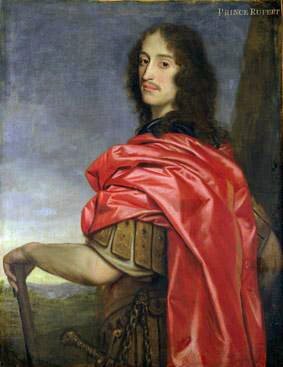 At first, Charles II encouraged Montrose to raise a Highland army to fight on the Royalist side. However, when the Scottish Covenanters (who did not agree with the execution of Charles I and who feared for the future of Presbyterianism and Scottish independence under the new Commonwealth) offered him the crown of Scotland, Charles abandoned Montrose to his enemies. However, Montrose, who had raised a mercenary force in Norway, had already landed and could not abandon the fight. He did not succeed in raising many Highland clans and the Covenanters defeated his army at the Battle of Carbisdale in Ross-shire on 27 April 1650. The victors captured Montrose shortly afterwards and took him to Edinburgh. On 20 May the Scottish Parliament sentenced him to death and had him hanged the next day. This vision of at least partial democracy in ecclesiology paralleled the struggles between Parliament and the King. A body within the Puritan movement in the Church of England sought to abolish the office of bishop and remake the Church of England along Presbyterian lines. The Martin Marprelate tracts, applying the pejorative name of prelacy to the church hierarchy, attacked the office of bishop with satire that deeply offended Elizabeth I and her Archbishop of Canterbury John Whitgift. The vestments controversy also related to this movement, seeking further reductions in church ceremony, and labelling the use of elaborate vestments as "unedifying" and even idolatrous. Figures for Ireland are described as "miracles of conjecture". Certainly the devastation inflicted on Ireland was massive, with the best estimate provided by Sir William Petty, the father of English demography. Petty estimates that 112,000 Protestants and 504,000 Catholics were killed through , war and famine, giving an estimated total of 616,000 dead, from a pre-war population of about one and a half million. Although Petty's figures are the best available, they are still acknowledged as being tentative; they do not include the estimate of 40,000 driven into exile, some of whom served as soldiers in European continental armies, while others were sold as indentured servants to New England and the West Indies. Many of those sold to landowners in New England eventually prospered, but many of those sold to landowners in the West Indies were worked to death. Jane Ohlmeyer discarded and replaced the historical title "English Civil War" with the titles the "Wars of the Three" and the "British Civil Wars", positing that the civil war in England cannot be understood isolated from events in other parts of Great Britain and Ireland; King Charles I remains crucial, not just as King of England, but also because of his relationship with the peoples of his other realms. For example, the wars began when King Charles I tried imposing an Anglican Prayer Book upon Scotland, and when this was met with resistance from the Covenanters, he needed an army to impose his will. However, this forced him to call an English Parliament to raise new taxes to pay for the army. The English Parliaments were not willing to grant Charles the revenue he needed to pay for the Scottish expeditionary army unless he addressed their grievances. By the early 1640s, Charles was left in a state of near permanent crisis management; often he was not willing to concede enough ground to any one faction to neutralise the threat, and in some circumstances to do so would only antagonise another faction. For example, Charles finally agreed upon terms with the Covenanters in August 1641, but although this might have weakened the position of the English Parliament, the Irish Rebellion of 1641 broke out in October 1641, largely negating the political advantage he had obtained by relieving himself of the cost of the Scottish invasion. English Civil War timeline of events leading up to, culminating in, and resulting from the English Civil Wars. The Thirty Years' War for a defining event in European history during the reign of Charles I. ↑ 5.0 5.1 Gregg 1984, p. 73. ↑ Gregg 1984, p. 123. ↑ 9.0 9.1 Gregg 1984, p. 175. ↑ 10.0 10.1 Purkiss 2007, p. 93. ↑ 13.0 13.1 Pipes 1999, p. 143. ↑ 22.0 22.1 Purkiss 2007, p. 96. ↑ 24.0 24.1 24.2 Coward 2003, p. 180. ↑ 25.0 25.1 25.2 Purkiss 2007, p. 89. ↑ Hibert 1968, p. 154. ↑ 33.0 33.1 Carlton 1995, p. 224. ↑ 34.0 34.1 Carlton 1995, p. 225. ↑ 35.0 35.1 Smith 1999, p. 123. ↑ Abbott, Jacob. "Chapter: Downfall of Strafford and Laud". Charles I. http://www.mainlesson.com/display.php?author=abbott&book=charles1&story=downfall. ↑ 46.0 46.1 46.2 Sherwood 1997, p. 41. ↑ 52.0 52.1 Wedgwood 1970, p. 100. ↑ 72.0 72.1 Wanklyn & Jones 2005, p. 74. ↑ 88.0 88.1 Seel 1999, p. 64. ↑ "King Charles I". Luminarium Encyclopedia. http://www.luminarium.org/encyclopedia/kingcharles.htm. Retrieved 8 April 2010. ↑ 95.0 95.1 Newman 2006, p. 89. ↑ Aylmer & 1980 p.25. ↑ 109.0 109.1 Leniham 2008, p. 128. ↑ 112.0 112.1 112.2 Carpenter 2005, p. 145. ↑ 113.0 113.1 Carpenter 2005, p. 146. ↑ 121.0 121.1 Weiser 2003, p. 1. ↑ 123.0 123.1 Kennedy 2000, p. 96. ↑ 129.0 129.1 129.2 James 2003, p. 187 cites: Carlton 1995a, p. 212. ↑ O'Riordan, Christopher (2001). "Self-determination and the London Transport Workers in the Century of Revolution". Archived from the original on 26 October 2009. http://web.archive.org/web/20091026215834/http://geocities.com/englishrevolution/workers.htm. .
↑ 148.0 148.1 Burgess 1990, pp. 609–627. Aylmer, G. E. (1980). "The Age of Milton: Backgrounds to Seventeenth-Century Literature". In Patrides, C.A. ; Waddington, Raymond B.. Manchester: Manchester University Press. pp. 1–33. Brett, A. C. A. (2008). "Charles II and His Court". Read Books. ISBN 1-140-20445-9. Burgess, Glenn (1990). "Historiographical reviews on revisionism: an analysis of early Stuart historiography in the 1970s and 1980s". pp. 609–627. http://journals.cambridge.org/production/action/cjoGetFulltext?fulltextid=933920. Carlton, Charles (1987). "Archbishop William Laud". London: Routledge and Keagan Paul. Carlton, Charles (1992). "The Experience of the British Civil Wars". London: Routledge. ISBN 0-415-10391-6. Carlton, Charles (1995). "Charles I: The Personal Monarch". Great Britain: Routledge. ISBN 0-415-12141-8. Carlton, Charles (1995a). "Going to the wars: The experience of the British civil wars, 1638–1651". London: Routledge. ISBN 0-415-10391-6. Carpenter, Stanley D. M. (2005). "Military leadership in the British civil wars, 1642–1651: The Genius Of This Age". Abingdon: Frank Cass. Croft, Pauline (2003). "King James". Basingstoke and New York: Palgrave Macmillan. ISBN 0-333-61395-3. Coward, Barry (1994). "The Stuart Age". London: Longman. ISBN 0-582-48279-8. Coward, Barry (2003). "The Stuart age: England, 1603–1714". Harlow: Pearson Education. Dand, Charles Hendry (1972). "The Mighty Affair: how Scotland lost her parliament". Oliver and Boyd. Fairfax, Thomas (1767-1830). "Journal of the House of Lords: volume 10: 1648–1649". Institute of Historical Research. http://www.british-history.ac.uk/report.asp?compid=32812#s24. Gardiner, Samuel R. (2006). "History of the Commonwealth and Protectorate 1649–1660". Elibron Classics. Gaunt, Peter (2000). "The English Civil War: the essential readings". Wiley-Blackwell. p. 60. ISBN 978-0-631-20809-9. Gregg, Pauline (1981). "King Charles I". London: Dent. Gregg, Pauline (1984). "King Charles I". Berkeley: University of California Press. Hibbert, Christopher (1968). "Charles I". London: Weidenfeld and Nicolson. Johnston, William Dawson (1901). "The history of England from the accession of James the Second". Boston and New York: Houghton, Mifflin and company. pp. 83–86. Hibbert, Christopher (1993). "Cavaliers & Roundheads: the English Civil War, 1642–1649". Scribner. Hill, Christopher (1972). "The World Turned Upside Down: Radical ideas during the English Revolution". London: Viking. Hughes, Ann (1991). "The Causes of the English Civil War". London: Macmillan. King, Peter (July 1968). "The Episcopate during the Civil Wars, 1642–1649". Oxford University Press. pp. 523–537. JSTOR 564164. James, Lawarance (2003). "Warrior Race: A History of the British at War". New York: St. Martin's Press. p. 187. ISBN 0-312-30737-3. John, Terry (2008). "The Civil War in Pembrokeshire". Logaston Press. Kaye, Harvey J. (1995). "The British Marxist historians: an introductory analysis". Palgrave Macmillan. ISBN 0-312-12733-2. Keeble, N. H. (2002). "The Restoration: England in the 1660s". Oxford: Blackwell. Kelsey, Sean (2003). "The Trial of Charles I". pp. 583–616. http://ehr.oxfordjournals.org/cgi/content/abstract/118/477/583. Kennedy, D. E. (2000). "The English Revolution, 1642–1649". London: Macmillan. Kenyon, J.P. (1978). "Stuart England". Harmondsworth: Penguin Books. Kirby, Michael (22 January 1999). "The trial of King Charles I – defining moment for our constitutional liberties". http://www.hcourt.gov.au/assets/publications/speeches/former-justices/kirbyj/kirbyj_charle88.pdf. Leniham, Pádraig (2008). "Consolidating Conquest: Ireland 1603–1727". Harlow: Pearson Education. Lindley, Keith (1997). "Popular politics and religion in Civil War London". Scolar Press. Lodge, Richard (2007). "The History of England – From the Restoration to the Death of William III (1660–1702)". Read Books. McClelland, J. S. (1996). "A History of Western Political Thought". London: Routledge. ISBN 1996. Newman, P. R. (2006). "Atlas of the English Civil War". London: Routledge. O'Riordan, Christopher (1993). "Popular Exploitation of Enemy Estates in the English Revolution". pp. 184–200. Archived from the original on 26 October 2009. http://web.archive.org/web/20091026215835/http://geocities.com/englishrevolution/popular.htm. Pipes, Richard (1999). "Property and Freedom". Alfred A. Knopf. Purkiss, Diane (2007). "The English Civil War: A People's History". London: Harper Perennial. Reid, Stuart; Turner, Graham (2004). "Dunbar 1650: Cromwell's most famous victory". Botley: Osprey. Rosner, Lisa; Theibault, John (2000). "A Short History of Europe, 1600–1815: Search For A Reasonable World". New York: M. E. Sharpe. Royle, Trevor (2006). "Civil War: The Wars of the Three Kingdoms 1638–1660". London:Abacus. ISBN 978-0-349-11564-1. Seel, Graham E. (1999). "The English Wars and Republic, 1637–1660". London: Routledge. Sharp, David (2000). "England in crisis 1640–60". Oxford: Heinneman. Sherwood, Roy Edward (1992). "The Civil War in the Midlands, 1642–1651". Alan Sutton. Sherwood, Roy Edward (1997). "Oliver Cromwell: King In All But Name, 1653–1658". New York: St Martin's Press. Smith, David L. (1999). "The Stuart Parliaments 1603–1689". London: Arnold. Stoyle, Mark (17 February 2011). "History – British History in depth: Overview: Civil War and Revolution, 1603 – 1714". BBC. http://www.bbc.co.uk/history/british/civil_war_revolution/overview_civil_war_revolution_01.shtml. Retrieved December 2012. Trevelyan, George Macaulay (2002). "England Under the Stuarts". London: Routledge. Walter, John (1999). "Understanding Popular Violence in the English Revolution: The Colchester Plunderers". Cambridge: Cambridge University Press. Wanklyn, Malcolm; Jones, Frank (2005). "A Military History of the English Civil War, 1642–1646: Strategy and Tactics". Harlow: Pearson Education. Wedgwood, C. V. (1970). "The King's War: 1641–1647". London: Fontana. Weiser, Brian (2003). "Charles II and the Politics of Access". Woodbridge: Boydell..
Young, Peter; Holmes, Richard (1974). "The English Civil War: a military history of the three civil wars 1642–1651". Eyre Methuen. Ludlow, Edmund (1894). "The Memoirs of Edmund Ludlow Lieutenant-General of the Horse in the Army of the Commonwealth of England 1625–1672". In C.H. Firth. Oxford: Clarendon Press.